Tag line: "THBefore you die, you see the ring"
If you look back on the history of horror movies, you’ll find a number of unforgettable screen monsters. From silent films (Nosferatu) and the early days of sound (Dracula, Frankenstein, The Wolf Man), through the ‘60s (Norman Bates), ‘70s (Michael Myers), ‘80s (Jason Voorhees, Freddie Krueger) and ‘90s (Candyman, Ghost Face), every generation has had their boogeyman. Surprisingly, one of the first truly frightening characters of the new Millennium wasn't a hulking beast or behemoth in a mask. It was an adolescent girl. A remake of the Japanese horror movie Ringu, The Ring stars Naomi Watts as Rachel Keller, a journalist trying to figure out whether or not a creepy urban legend, centering on a video tape of unknown origin, is true. As the story goes, whoever views this tape will immediately receive a phone call from the beyond, with a frail voice on the other end of the line informing them they have only seven days to live. And how does Rachel begin her investigation? By watching the tape, of course! Much to her dismay, she discovers the legend is, in fact, quite real, and now faces a deadline of one week to uncover its mysteries before she herself becomes the next victim. Along with a handful of entertaining twists and turns, The Ring also boasts an incredibly dark atmosphere, which alone is good for some spine-chilling moments (there’s a sequence featuring actor Brian Cox, set in an old house, that’ll have you glued to the edge of your seat). The videotape itself, containing black and white images of seemingly random people and places, is eerily confusing, and its final shot of a solitary ring of light may cause a few to experience nightmares. But what you'll always remember about The Ring is the little girl Samara, played by Daveigh Chase. Without going into spoilers, let me say that nothing can prepare you for the shock of a later scene involving Samara, a television, and an outdoor well. I get goosebumps now just thinking about it. 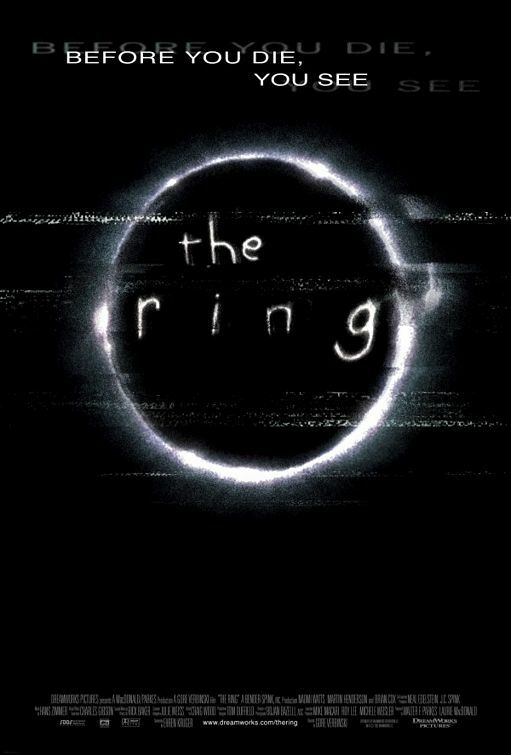 The Ring is a movie even the most jaded of horror fans will enjoy, a supernatural tale that, like The Exorcist before it, will remain with you long after the film has ended. This is a case where I like the American remake almost as much as the Japanese original that spawned it. I saw this in the theater with my sister. I remember explaining the impact of the ending to her on the way out to the car, or at least my interpretation...there was a moment of wide-eyed realization from her. I think that made her like the movie a lot more when she realized what the ending might imply. has a spooky atmosphere & naomi watts is a good actress. i need to revisit.